Beat the heat this summer with my Strawberry Greek Yogurt Popsicles– a fun and nutritious summer treat that kids and adults will love. The recipe uses Greek yogurt- one of my favorite ingredients. Not only is it healthy but it’s also delicious and so versatile. While most people have tried Greek yogurt plain or perhaps topped with fruit or granola, the truth is that it can be used in a very wide variety of dishes, both savory and sweet. It’s is a nice healthy substitute for high calorie condiments like mayonnaise and sour cream. It can also be added to sauces, soups and pasta dishes to add creaminess without adding any fat. You can even use it in desserts like cakes, cheesecake and pudding. To read all about Greek yogurt, CLICK HERE. 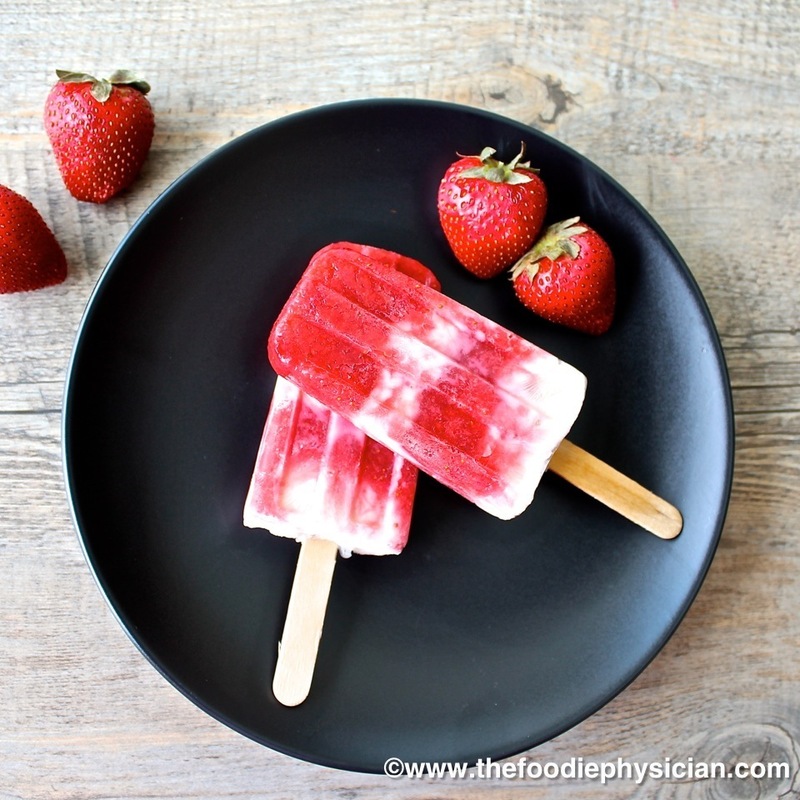 My popsicles pair tangy Greek yogurt with sweet, fresh strawberries, which are abundant this time of year. Not only are strawberries delicious, they also happen to be packed with vitamins, minerals, fiber and antioxidants. Vitamin C is a powerful immunity booster and one cup of strawberries has more than 100% of your daily recommended amount of it. This easy three-ingredient recipe is a great way to get your kids in the kitchen. 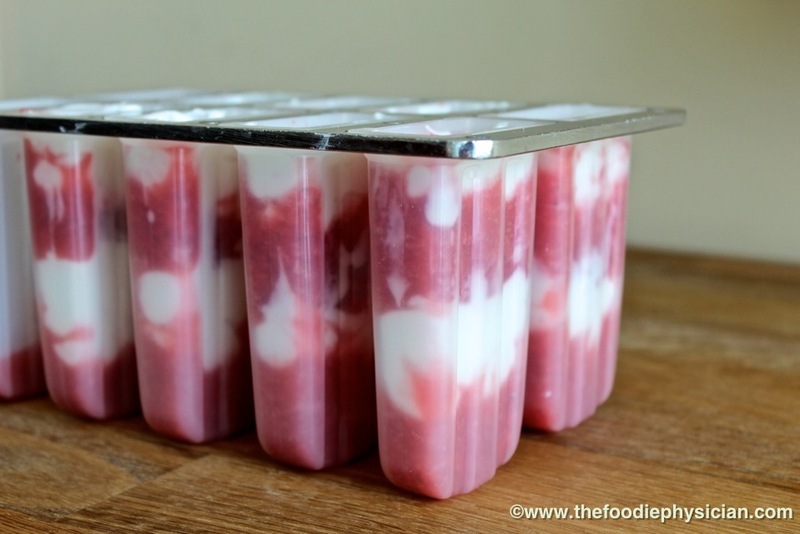 They’ll enjoy adding the fruit and yogurt to the popsicle molds in layers and seeing the finished product a few hours later when it emerges from the freezer. And you’ll have a nutritious snack that you can keep in the freezer for whenever they (or you) have a craving for something sweet. You can get creative and try other berries- blueberries, blackberries or raspberries would all work well in this recipe. 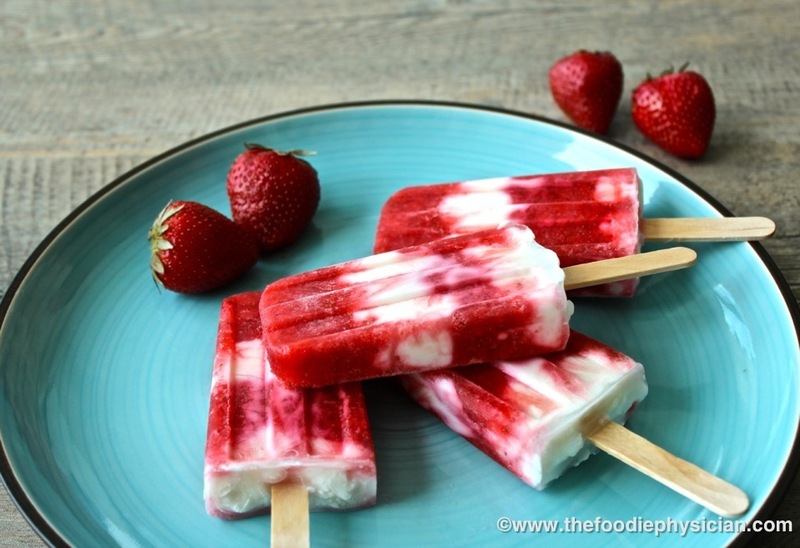 Beat the heat this summer with my Strawberry Greek Yogurt Popsicles- a fun and nutritious summer treat that kids and adults will love. 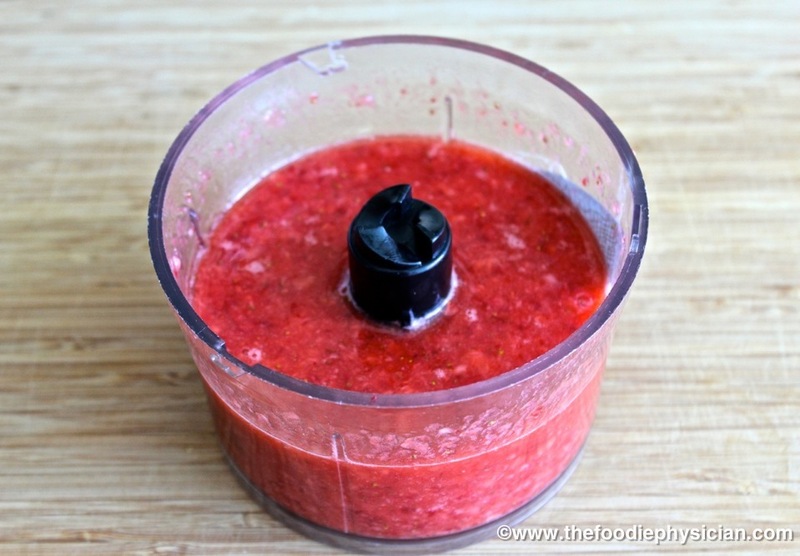 Place the strawberries and 2 tablespoons honey in a food processor and puree until it is smooth with some small chunks of fruit. Mix the yogurt and remaining tablespoon honey in a bowl until smooth. 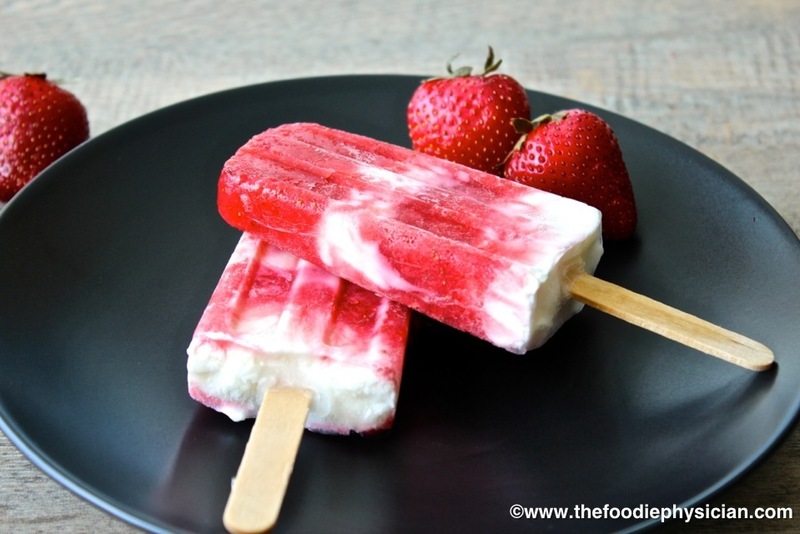 Spoon 2-3 teaspoons of the strawberry puree into the bottom of each popsicle mold and then spoon about 1 ½ tablespoons yogurt on top of the fruit. Repeat with another layer each of strawberry puree and yogurt. Place the popsicle sticks into the popsicles, cover and freeze for a few hours until solid. Alternatively, if you don’t have popsicle molds, you can use small paper cups. To unmold, dip the popsicle molds in warm water to loosen them and then pull the popsicles out. Here in South Florida too! Thanks for stopping by! What a lite treat for a hot steamy day and you make it so easy to make!! Yes, they're perfect for this hot weather. Enjoy! Wow what a nice recipe. I never maid ice palm at my home. Because this is good for me try it. Thank you! They are very easy to make. Let me know how it goes! I tried clicking the link for the cucumber mojito ones and it doesn't lead to a recipe. Sorry, GMC Trade Secrets took down their site. I'll post the recipes soon. Thanks for stopping by! Any updates on the cucumber mojito ones? Where did you get the molds? I bought them on Amazon- they have a wide selection of popsicle molds.